In part one of this two-part series, we talked about two things. The first thing we mentioned was that we are Northern Virginia’s top tree care specialists. With over 40 years of experience providing services that include tree stump removals, tree trimming services, tree pest control, and even tree fungus treatment, it’s easy why people in communities like Ashburn, Alexandria, McLean, Springfield, Fairfax, and Vienna think of us as their defacto “tree doctors” of the area. The second thing we mentioned, as you might have inferred from the title, was “How To Hang Holiday Lights In Your Yard, Part One”. If you haven’t started there, we strongly recommend doing so. Although the majority of the content discussed had more to do with the theory and preparation work behind hanging Christmas tree lights on your home, there were still a few gems in there. Namely, you need to have a vision of what you want. Within that vision, you’ll need a focal point. We also discussed safety and how to go about draping your lights in a cautious way. Keep reading if you are ready for part two! Maybe this belonged in part one, but better late than never, right? When you are laying out your lights and checking them to see if they still work, make sure that the cords aren’t damaged or frayed at all. You can’t afford to have even one dysfunctional strand. In reference to the kind of light you are using, keep in mind that not all white lights are guaranteed to look alike. For example, LEDs will have a different hue than incandescent bulbs, which can appear orangish. That is certainly something to consider when mapping out your master plan. Consider grouping your light-types together in order to create a more uniform, intentional vibe. While we are mentioning it, LEDs represent great value among other light types because they don’t use very much energy, plus you don’t need to worry about them overheating! Our final two words of advice, when it comes to light types at least, would be to use outdoor, waterproof lights. This means you’ll need to check if your lights are tagged with a “UL”, or underwriters lab. This denotes your lights being up to the national standard set by, you guessed it, the American National Standards Institute. 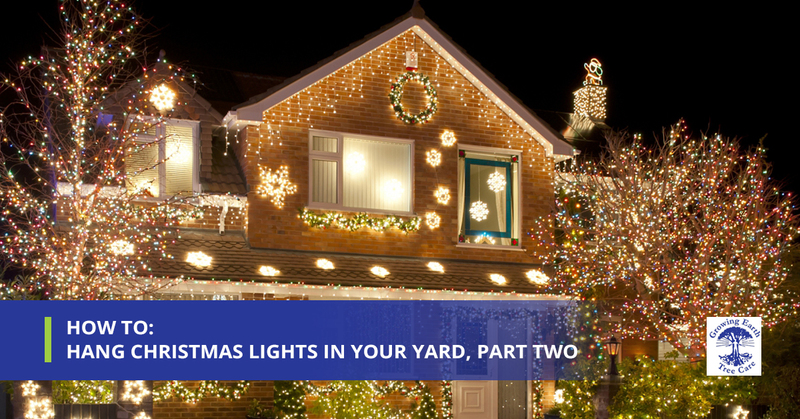 Lastly, make sure your extension cords are approved for outdoor use, just like your holiday lights. Start at the bottom of any tree you are attempting to decorate, stringing your lights around the tree (or through it) in any fashion you wish. We aren’t an advocate of having too much uniformity. Trite spirals and other obvious patterns have become cliche. A natural vibe is far superior, in our opinion. To create this effect, lay your lights out in various depths. And there you have it! That’s not too difficult, now is it? Of course, no two yards are alike. So you might have some of your own challenges to deal with that we didn’t address here. And while we may not be able to troubleshoot the problems with your yard in reference to hanging Christmas tree lights, we can certainly help you with any tree care needs you might have. If you are in need of a free estimate from Growing Earth Tree Care, you can get yours, today!